Over the past few weeks, fliers warning about a white nationalist rally have been popping up around the Bluff Park area in Long Beach. You can see them in the windows of businesses around Alamitos Beach and Retro Row. They urge people to show up and outnumber the racists, whom they say are planning to rally in Bluff Park on April 28. “Don’t let them bring hate to Long Beach unopposed!” says one flier going around. The publicity, which has swept through the area on social media and by word-of-mouth, may have killed the rally before it ever began. But that won’t stop the counter protestors from showing up, just in case. The counter rally and publicity campaign were in response to a now-deleted Facebook post made by a group called United Patriot National Front or UPNF. The event, titled “Freedom’s Safest Place” was billed as a rally in support of freedom and free speech. But local activists were quick to point out UPNF’s ties to far-right groups. A January report from the Southern Poverty Law Center has linked the group to known violent white nationalist Antonio Foreman. He attended the infamous Unite the Right rally in Charlottesville that left a woman dead. He was also seen in San Diego in early 2018 as part of a far-right group that included the then newly formed UPNF rallying in a park in the working-class Barrio Logan neighborhood. For its part, UPNF denied being a white nationalist or supremacist group. “We are proud Americans,” the group said in a March 18 Facebook comment in response to criticism of its event. UPNF didn’t respond to a request for comment for this story. The group has since changed its name on Facebook to Everything Patriot and Tactical and deleted the event page for the rally, which had only garnered a handful of RSVPs. “If United Patriot National Front does not show up, then we’ll celebrate a job well done!” organizers said in an email. In an update posted Monday, April 15, the community group said it will continue with the planned counter rally to not only raise awareness of the dangers of white nationalism and racism but also, in case any white nationalists do show up, they can be blocked, drowned out and kept out. Organizers said the event will also serve as a message for those who attend a March Against Sanctuary State event in Huntington Beach the day before the counter rally. Long Beach community members, including those connected to the local Antifa and Democratic Socialists of America chapters, are planning to join a counter demonstration there as well. Sometimes opposing rallies like this have turned violent, such as in Berkeley and Charlottesville in 2017. The Long Beach Police Department has been made aware of the Bluff Park rally, according to spokeswoman Arantxa Chavarria. 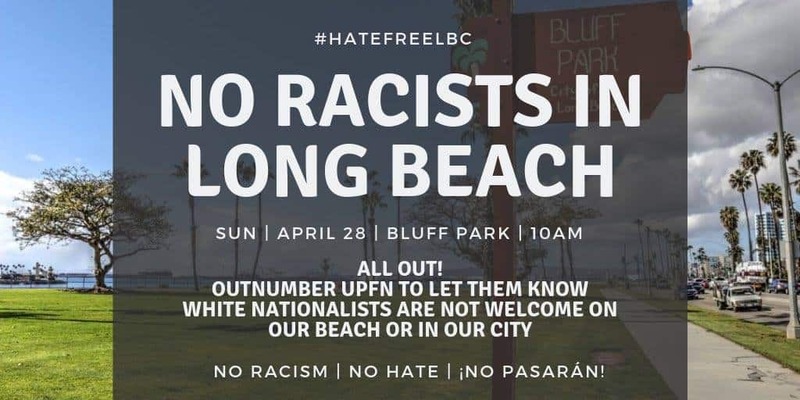 The Long Beach counter rally will take place at 10 a.m. on Sunday, April 28 at Bluff Park, located on Ocean Boulevard between 20th and 36th places.